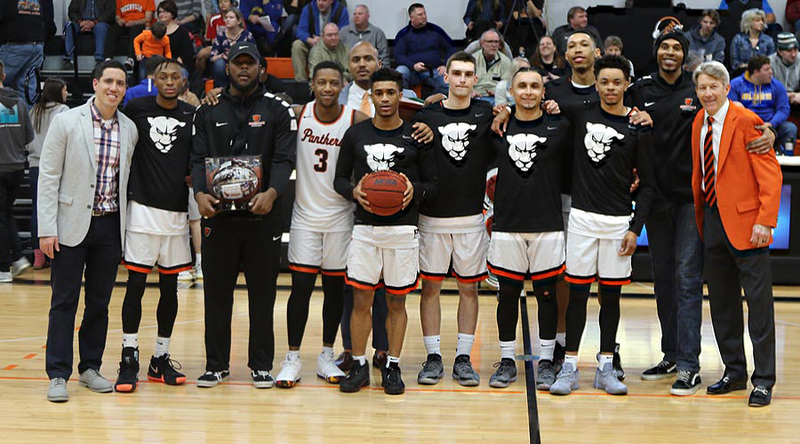 Greenville coach George Barber has seen and heard it all about his team’s 200-point outing on Saturday, and how the team got to that final point total. 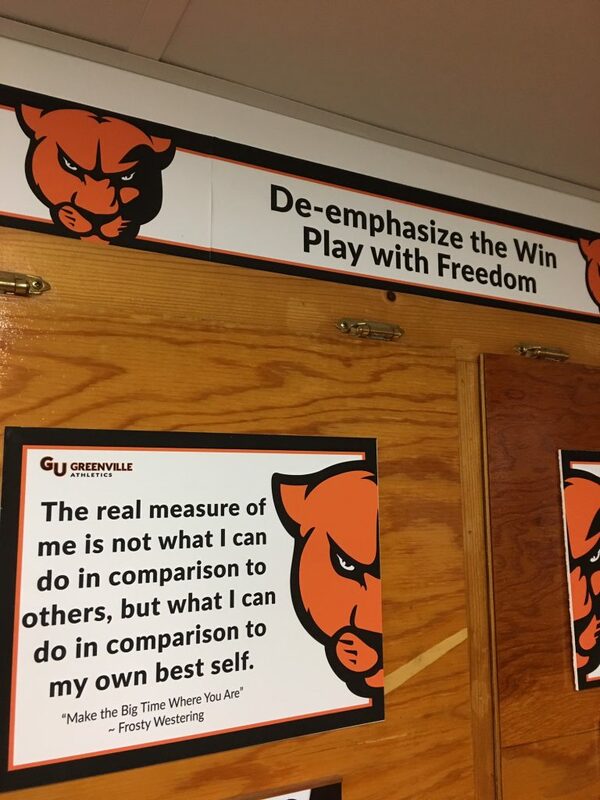 He shared his thoughts with D3hoops.com, and they run below, unedited. With 173 points and with roughly 6 minutes to go, I said “Go for it.” I had never seen that many points on a scoreboard with that much time left in the game. There was a palpable shift in the crowd in the final minutes from “Will they win?”, to “Will they get 200?” You could feel it. A lot of the angst centers around winning and losing, and where sportsmanship fits in once one of those possibilities is certain. This brings up a point we make with our team all the time. Is winning an idol? 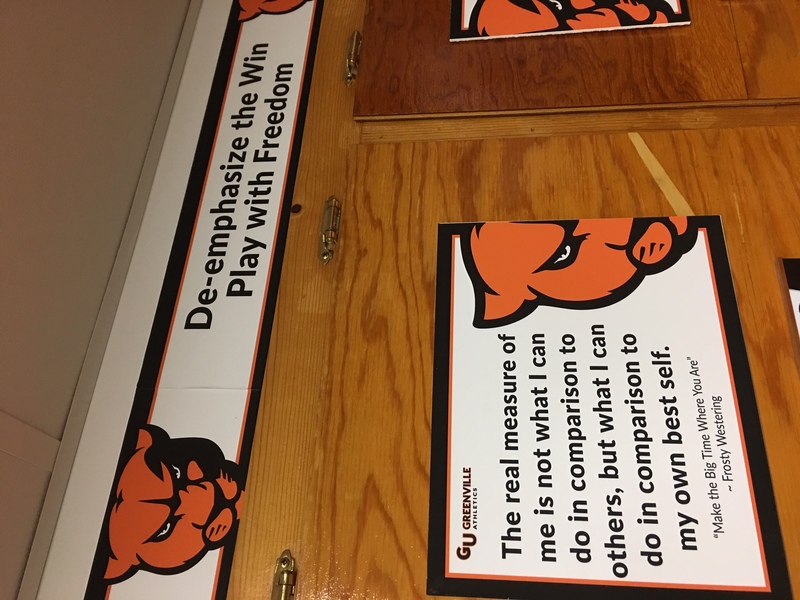 We have a wallpaper sign in our locker room that says: “De-emphasize the Win, Play with Freedom.” If you take away the possibility of winning, (or losing) will you still play hard? Is it only about winning and losing? With our style we can be up 30 and lose, down 30 and come back and win, and even if there is no possibility of one or the other, will you give it your best? Will you give it your absolute best? This was a conference game against a team that has beaten us often. Earlier in January we beat them by 12, and were losing with about 10 minutes to play. I was nervous because it was Senior Day with a lot of distractions and was just hoping we would play well. One of my starting point guards (we rotate 10-15 players a game and call anyone in the top 10 a starter) was out with an injury (he literally told me as we sent him to the scorer’s table checking in – I can’t go). So instead, we played a JV point guard (2nd Varsity game ever) all game. We had suspensions, ineligibility due to lack of financial aid and unpaid bills, and academic dismissals, etc. The bench was full of guys in street clothes. I was just hoping to survive. We caught fire from the three, and as the game wound down, I remember thinking, I’ve never seen a score this high (173), with this much time on the clock (just over 6 mins) and that’s when I made a decision: If they (opponents) keep trying to score, we’ll keep trying to score and see what happens. I knew some people would crucify me, but with seniors playing in front of their parents, some for the first time live in a college uniform, we would go for it. I emphasized trying (for the goal), not necessarily getting it (the 200), in the last five minutes. At that point I felt 198 to whatever the opponents had would not have been as memorable as 200 would be. They (the team) hate it when I pull the press off. We don’t even practice, ever, defense without a press. Side note, a couple of weeks ago, we were up 40 with 10 mins to go and my assistant said maybe we should consider taking off the press. I agreed and you could see a real let down in the kids. I told them we don’t want any hard feeling with the opponent’s coach. The opponent from that point on stormed back in the game, however we held on to win by 12 or 13. In that game, we had two players in the same shift (unusual) with a lot of points. One had over 30, and one had 28. I asked the one with 28 (and the entire team) not to shoot allowing him to go for 30. He was frustrated, but he complied and dribbled out the last 30 seconds. I felt bad for him, but was so proud of his compliance and deference to me and my decision to put team goals and relationships above his personal goals. After the game, we introduced parents and guests, and follow that our usual “Put-up’s” (we do this whether we win or lose), where we let players give each other compliments about things they did well during the game, followed by an “ATTAWAAAY!” cheer from the team. After our Put-Up’s I told them, “You just went to the moon! Not very many people get to go to the moon! (Scoring 200) Also, not everyone likes it that you went to the moon. Their will be some that don’t like it and will say negative things. Our job will be to respond graciously to both compliments and negative comments.” They all nodded, we had a little further conversation, and it was a great teaching moment. I almost feel like I have to apologize for doing this, and certainly that’s fair for some to think. I remember the first time we played System basketball, and the agonizing decisions I had to make after thoroughly researching this style of play before making that decision to go for it. I knew, once we went for it, there was no going back. On long, silent, in the dark early morning jogs, trying to contemplate all the implications of playing this style of basketball, and fully aware of the possible negative reactions, I decided to paint Picasso style. I felt we needed it in our game and at least for me and our program. It had the possibility to take some of the holy emphasis off winning. It could “release” the energy of the young people, as opposed to “harnessing” that energy. It would increase participation from traditional 8-man rotations to possibly double that number. I felt all these were positive things. Plus, I felt it would be exciting and fun. It would require super buy-in (a good thing), require super unselfishness (a good thing), and allow more people to get on the floor and in the game when the game was on the line. Increased participation would allow me to at least engage more guys, believe in more guys, and have ministry with more guys. When we unfurled The System for the first time to an unsuspecting Illinois Wesleyan team coached by my friend Ron Rose in the Shirk Center in Bloomington. I had a prepared apology for Ron after the game. We lost 150 something to 117, and as planned, I apologized in the line shaking hands after the game. To my surprise Ron hugged me and said, “This looked good, keep it up!”. That was a great encouragement to me. I wondered if he would have said that if somehow, we would have come out victorious over the Titans. Either way, it meant a lot to me. After the game, in the locker room at IWU, I said, “I know you lost by 30-something, but I am proud of how you fought the entire game! And, you just set a record for the most points scored by an opponent in the Shirk Center.” It was a start! Another weird side note. During President Lincoln’s tenure, Secretary of War Stanton has to order executions for deserters. I read that wives, mothers, and children would go to his office to plea for a pardon. He felt though that to keep discipline and for the larger purpose, he would not choose to give the pardon. As he families left, he would retreat to a back room and weep. I made the decision to let my guys go for 200, because in the end I thought it would be special. Some may disagree with what I did, and I have to take that responsibility and shoulder that reality. I do not want it to permanently damage relationships, and would weep about that. I hope I respond graciously to both those who agree and those that disagree with what I did. This entry was posted in General and tagged 200 points, George Barber, Greenville. Bookmark the permalink.